Sadly, memories of my first trip abroad—the trip to France that started it all, way back in high school—are already blurring. But one observation I remember quite clearly concerns the French people's relationship to their capital. It struck me, at that young age, that Paris was more than just a capital city—it was the sun around which the French universe turned. Everyone in Paris seemed self-absorbed, haughty, perfect—at the pinnacle of their society and well aware of their superiority. And everyone outside of Paris seemed to count the days from their last trip to the capital and until their next one, seemed continually obliged to justify why they were not living in the capital, seemed unable to hide how self-conscious they were of their very provincial existence. Paris was the center of a vortex, tugging ceaselessly at Frenchmen and -women, obliging them to make a conscious lifelong effort to resist its pull. Twelve years later, I can't recall a single conversation that led me to this conclusion, but the impression sticks in my mind nonetheless. Back in June, locals spent a Saturday watching the waves along the Mediterranean coast west of Algiers. The lady friend and I had planned a long weekend in Paris primarily to catch up with each other, but I was also very excited to develop the film I had been accumulating for six months, ever since leaving DC. In Algeria, photo shop staff laugh when I ask if they can develop film. 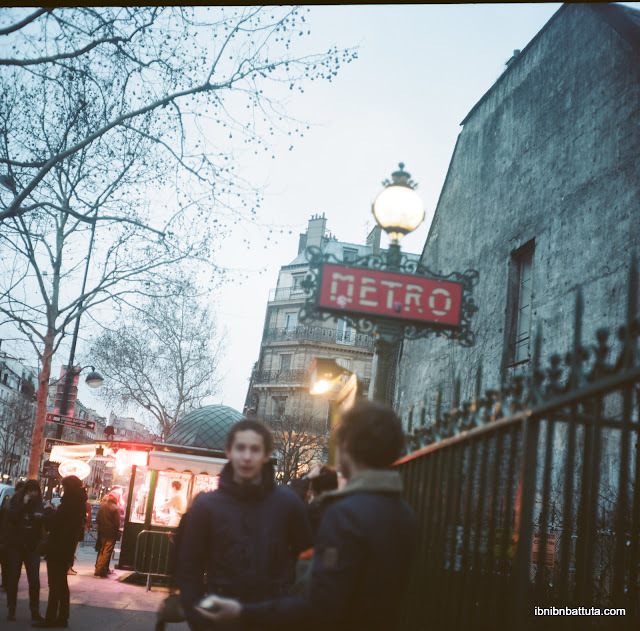 But in Paris I discovered that almost every corner photo lab both develops and sells the specialty 120-format film that my Rollei uses. In a rare moment when we weren't stuffing ourselves with bread and cheese, I biked to one lab to drop off nine rolls of film. Then I waited and worried: After dragging the film all over the world—through the Algerian summer sun, the Swahili coast's humidity, and dozens of airport x-ray scanners—would it be salvageable? Would any of the pictures even be any good? What a relief, then, to finally pick up the photos and learn that they had all turned out better than I could have imagined. Paging through shots from around Algiers, from this summer's trip to Burundi and Lamu, and from my visit to Constantine and Timgad, I was amazed all over again at how this rudimentary little box that's been knocking around more than twice as long as I've been alive can still capture such images, even in the hands of someone still learning how to use it. 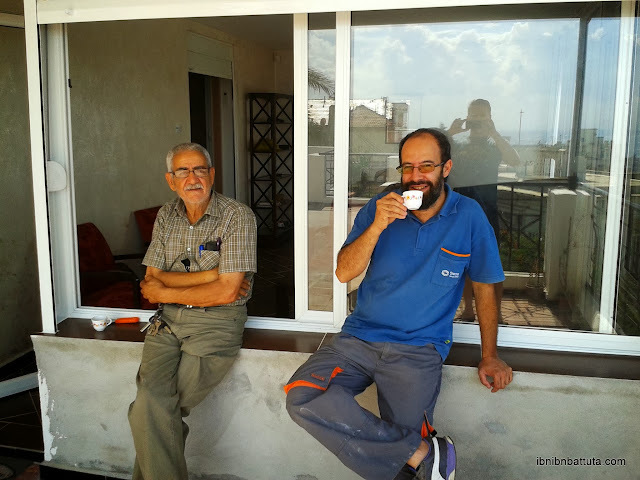 At left, friendly Lou Shauri relaxed with his friend Abbas beside Lamu's town square. During our time in Lamu back in August, I found that just showing the Rollei a bit more overtly made it a great tool for meeting new people. 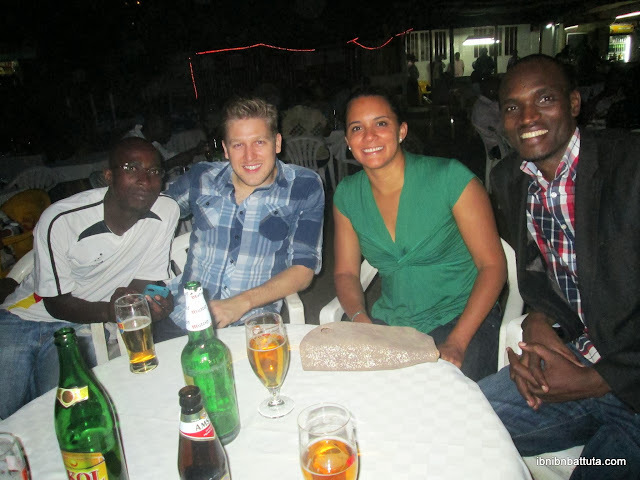 Its appearance in the hands of a peculiar blond-haired mzungu seemed to surprise many, and instantly invited conversation. Late one afternoon, I was strolling among the fruit and vegetable sellers who had spread their wares across Lamu's main square, looking for photo opportunities in the dappled light sneaking through the grand trees overhead. A man selling used sandals and shoes from a blanket stopped his work to ask me all about the camera, grinning with fascination as I told its story. "1951?! Mm, mm, mm…"
Across the square, I paused to load a new roll of film, and attracted the attention of another local, Lou Shauri, who was lounging with his friend and waiting for iftaar to arrive. Lou was a Lamu native, but told me how he left the island at age 23 to come live in the US. He had spent the last three decades in Columbus, Ohio, where he has a family, but returns regularly to Lamu for his holidays. House Hunters International, Algiers: Episode 3, "Is It Over Yet?" What do you say to a gift like that? I was damn near speechless. The joys of homemaking in Algiers continue where they left off (see Episode 1, "It's Worth It for the View" and Episode 2, "MacGyver's Revenge"). By the time October rolled around, my apartment was finally starting to look like a proper home, except that I still had no bedroom door, no lamps, and a satellite dish that picked up only German channels. As the extended Algerian summer finally faded away, the long-promised patio furniture and barbecue for the terrace—probably the features I had been most excited for back in June—were still nowhere to be found. House Hunters International, Algiers: Episode 2, "MacGyver's Revenge"
Hamid (left) and Jaouad (right) enjoy some coffee before getting started on the day's work. The joys of homemaking in Algiers continue from where they left off (see Episode 1, "It's Worth It for the View"). Hamid wiped off some snot with a wrinkled forearm and squinted at me through his Coke-bottle glasses, over a bulbous nose and bushy gray mustache. It was hard not to feel sorry for him as he whistled at me through the gummy space where his front teeth once were, now just framed by the odd browned incisor: "Andrew, je suis tres fatigué aujourd'hui. Tu sais, Monsieur Andrew?" Yes, Hamid, I know you're tired today. It was Ramadan, after all, and scorching hot at midday. As a result, progress on the apartments had slowed to a crawl. The oft-promised "ten more days" slipped further behind us as July wore on. But not to worry, realtor-turned-contractor Reda and his band of merry men were still on the job. One day I entered the villa's foyer and almost tripped over Hamid, who was standing in the entryway, his pants around his ankles. He yanked them up and refastened his belt. No explanation offered. House Hunters International, Algiers: Episode 1, "It's Worth It for the View"
In June, the magnificent view of the Mediterranean from my kitchen was not yet hindered by silly things like windows. 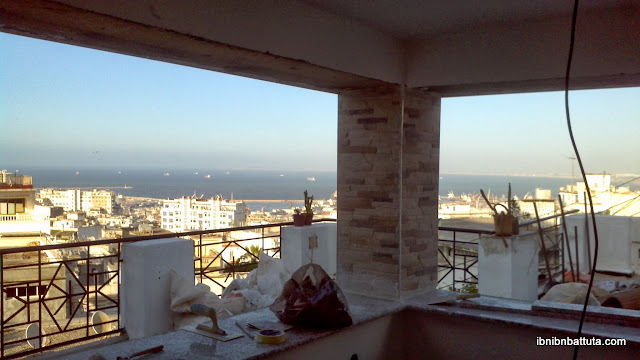 Soon after shipping off to Algiers back in June, I and another recently arrived colleague visited a series of apartments around town, hoping to find the perfect homes. We saw an apartment irreparably infused with the stench of a fishmonger two stories below, an otherwise beautiful apartment with all the windows bricked up, an apartment decorated in Rolling Stones lips motifs, and more. The owner, a jovial middle-aged businessman named Aziz, assured us that he would need just a little more time to finish the work—"Nothing to worry about; we'll take care of it. Another ten days or so." That was the beginning of June—and the beginning of a very long adventure. Banksy's contribution from October 17 (photo source). The most interesting event of the month was not the shameful US government shutdown but British street artist Banksy's New York "residency". Entitled "Better Out Than In", Banksy's city-wide experiment provoked reactions from comedic to awkward to insightful. 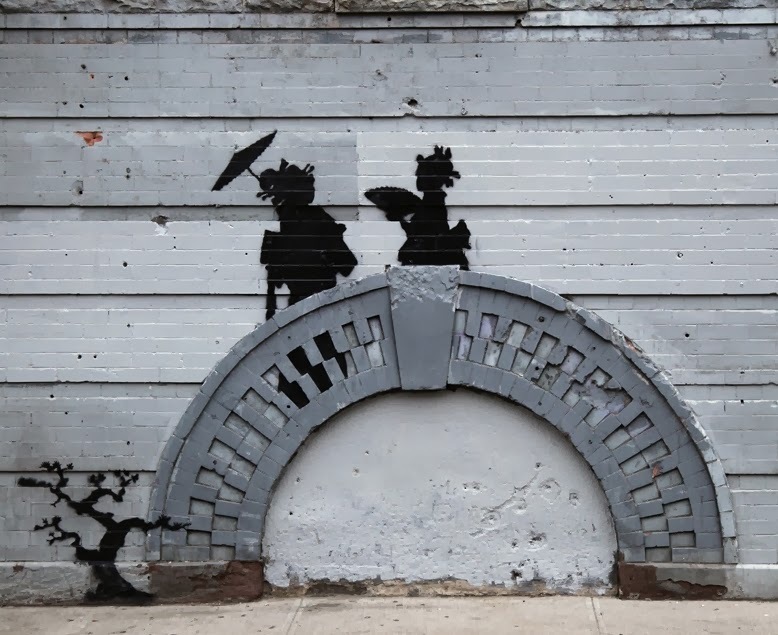 See Banksy's record of the month's work on his website. My favorite story this month; a poignant account of a family's search for home. A profile of the obscure Iranian mastermind who has been calling the shots in the Middle East for decades. Massive global surveillance, unaccountable drone strikes, and secret courts are killing the American brand. On the social ripples of Turkey's conversion from Arabic to Latin script—more interesting than it sounds. Also, see great reader comments, including one linking to the story of how a single Turkish typo drove one man to murder! When an Emirati royal published an op-ed this month calling the Gulf's sheikhdoms the "nerve center of the contemporary Arab world’s culture" and criticizing the decline of North Africa and the Levant, he set off quite a debate. Since leaving his native Canada in 1990, Bown has visited every country on earth, and found out that it is a big place. ("I would never have thought it would take so long to see it all. It's enormous.") His takeaway from the experience? "People are basically good and worth knowing whatever the race or culture they hail from." Amen. In my many months in Algeria, my colleague Karima has invited me several times to her family home in Constantine, Algeria's third largest city and the capital of the eastern region. Over the recent Eid, I was finally able to take her up on the offer, and traveled there for four days with Karima, her sister Wassila, and brother-in-law Khaled. This being Eid, I spent my much of my time in Constantine sitting around a table and eating with their extended family. Constantine is renowned for its cuisine, and true to form, I did my best to sample all of it and carry back as much as possible in my stomach to Algiers. Their aunt invited us for a special homemade Eid dinner—rich djari soup, fresh lamb kefta, and a mouth-watering rendition of chakhchoukha, an eastern Algerian delicacy of shredded flatbread stewed in a spiced tomato sauce and topped with chunks of chicken and mutton. No contest, it was the best meal I have eaten in Algeria. The Grande Poste, Algiers' central post office, anchors downtown. The country Algeria and its capital, Algiers, sound quite similar in English, but are in fact exactly the same word (الجزائر) in Arabic. 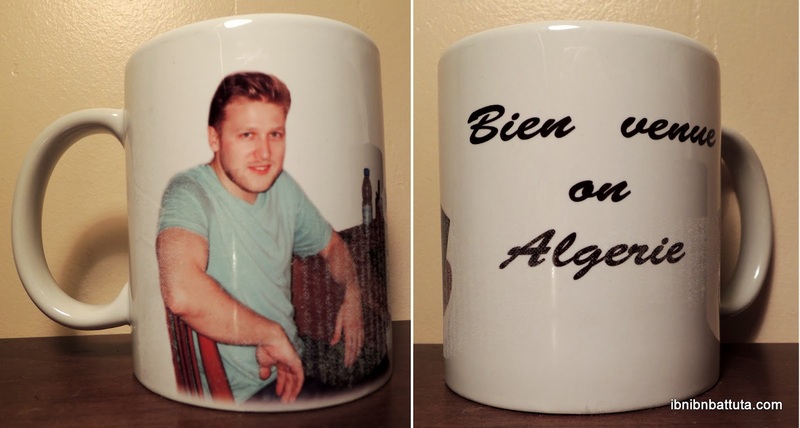 Yet while every citizen of Algeria is an "Algérien", the residents of Algiers distinguish themselves with a special term—they are the "Algérois". And theirs is indeed a special city. Though still a relative newcomer, I have gotten to know Algiers much better since relocating here in early June. That said, there are far less picturesque cities in which to get lost. In the Tocquevillian tradition, a young Indian shares his thoughts on two years in America. I find such perspectives refreshing; they help me to recognize—and reflect on—the peculiar things about my homeland that I otherwise forget are so peculiar. The genesis of celebrated Tunisian fruitseller Mohamed Bouazizi's desperation, in a fictional first-person account, as told by one of North Africa's modern literary giants. An American war reporter finally writes home to explain why he traveled to Syria, why he's staying, and why he doesn't care whether you approve or not. Kudos to the filmmakers who have exposed this most despicable of scandals. For reasons I can't explain, I've spent a good part of the month pondering this piece, a dispatch from the outskirts of Australia. It's a vivid visit to the home of a castaway pushed—for what become obvious reasons—to the ends of the earth. Rethinking the 'Responsibility to Protect', and considering an enlightened alternative. Tracing the remnants of "Little Syria" in the Big Apple. A fascinating trend that, if it picks up, could have big implications for African nations' economic development and foreign relations. A Ugandan journalist in Nairobi critiques narratives around the Westgate Mall attack. It's no surprise that these merchants are using a secret code to keep customers in the dark, but who would have guessed that it would be ancient Hebrew? After filling up my first passport six years ago, I've had a nice run with my second. Ragged blue booklet in hand, I've explored many wonderful places, visited many old friends, and met many new ones. But now it too is full; out with the old, in with the new. Here's to more safe, challenging, and rewarding travels! So close, yet so far: Migrant workers take in downtown Doha from across the harbor. Thanks to a reservation glitch at the Tribe Hotel in Nairobi—and a pleasantly accommodating reception clerk—Rebecca and I spent the final days of our vacation in the hotel's two-story, no-expenses-spared Penthouse suite. And just think, only a few hours before arriving there we had been traipsing through donkey droppings in Lamu! Lacking mega-malls back in our respective homes, we spent much of our time in Nairobi stocking up on housewares and other amenities at the nearby Village Market mall, a gleaming monument to Kenya's massive income gap. In a month where the comedians sometimes seemed to offer more insight than the pundits, this ultra-brief letter to the editor put the absurdity of the modern Middle East conflicts and alliances into much-needed perspective. Ominous: "Morsy's single greatest mistake, in retrospect, was failing to put those fears to rest by ruling with the forces he had politically defeated. He was a bad president, and an increasingly unpopular one. But nations with no historical experience of democracy do not usually get an effective or liberal-minded ruler the first time around. Elections give citizens a chance to try again. With a little bit of patience, the opposition could have defeated Morsy peacefully. Instead, by colluding in the banishment of the Brotherhood from political life, they are about to replace one tyranny of the majority with another. And since many Islamists, now profoundly embittered, will not accept that new rule, the new tyranny of the majority will have to be more brutally enforced than the old one." If only it were that easy. Nonetheless, a great analytical effort to extract lessons from Egypt's democratic meltdown. Recent analysis of the Syria conflict has fallen out of date almost as soon as it has been published, so most links aren't of much use. Nonetheless, remembering a certain recent war into which the US rushed headlong without sufficient justification, I hope public opinion considers the questions raised by George Packer, John Cassidy, Michael Collins Dunn, and other cool heads (including even The Onion). If we can't even express in plain language what we hope to accomplish by striking Syria, we definitely shouldn't do it, however touched we all are by the latest tragedy or the larger conflict. Finally, an uplifting story! A nice overview of Algeria's talented El Gusto orchestra. From India, a useful reminder that there are no shortcuts when it comes to the hard work of changing human behavior. On the growing "class divide" in flying, reflecting broader trends in our society. I've been saying it for years: this stuff is poison, and someday soon we're going to look back and wonder how doctors ever prescribed it. (Think bloodletting.) I'm done with it. Maybe, but anything that might revolutionize transport in our lifetimes is still tantalizingly cool, especially when someone as dynamic as Musk is behind it. Mathematical proof of the idiocy of visas: requiring a visa for travelers from a given country is "associated with a 70% reduction in inbound travel from that country". I have visited, though I didn't have as much fun as this guy did there! An enjoyable photo essay. Catching a ride from Lamu, the island's main settlement that dates back to the early days of the Swahili coast's booming trade routes, to Shela town, a more modern expansion (pictured). After four days of hopping through at least that many countries, I still wasn't quite in a vacation frame of mind when the lady friend and I left Burundi and flew to the Kenyan coast to visit the isle of Lamu. 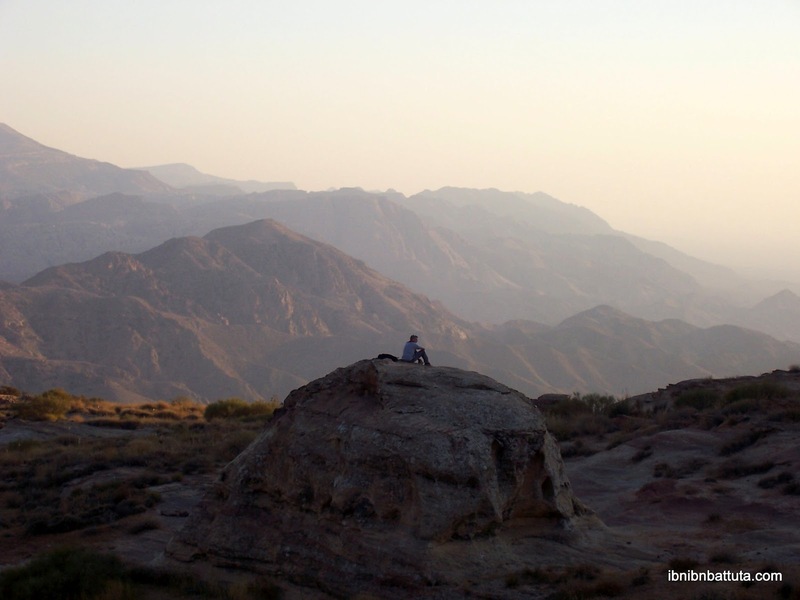 There I received a much-needed reminder for the nth time that "Travel is what you make of it." Lamu is second only to Zanzibar among the most famous destinations along the Swahili coast, probably my favorite part of the world. So I arrived there excited, but still quite uptight after months of too much desk time and too little sunshine. It showed in those first few days, which we spent exploring the museums and restaurants of Lamu town and the shops and beaches of nearby Shela town. Uvira, in all its glory: This is the main road through town. While in Bujumbura, Rebecca and I drove right across the Burundi-Congo border to Uvira, the town where she is posted for the next year for work. Her move to Uvira coincided with my own to Algeria earlier this summer, so like me she is working to carve out a new home for herself—though in an environment that is considerably more challenging than my own. I have visited the eastern DRC before, and Rebecca had already given me a sense of what Uvira looked like ("Get ready for it. It's a shithole. "), so I felt like I had a good mental picture in advance of what awaited there. It did not disappoint. Dusty, potholed, and spectacularly rundown, Uvira is what human civilization looks like in the total absence of government. And that is effectively what it is, being a backwater town in a neglected region in one of the world's most dysfunctional and corrupt countries. Signs of public works or public services are hard to recognize. The rumors are true: Burundi is indeed a happy little corner of central Africa. Many friends—Rebecca most of all—had told me so, and I felt it the moment she and I arrived from Kigali for the second stop of our East Africa vacation. Everyone from immigration officials to porters flashed smiles and offered cheery greetings. Even Bujumbura's airport itself gives off a sunny vibe. Though perhaps in need of a fresh coat of paint, the modernist building with its mushroomed rooftops reminded me of images from Africa's golden years. Standing before it, you can almost picture what must have been a joyful ribbon-cutting ceremony in that happy post-independence decade long before my time, when fresh optimism was in the air. For our first meetup, Rebecca and I sketched out an ambitious two-week sweep through East Africa, to include time relaxing on the beach, exploring new places, eating well, and also shopping for many of the random items we can't find in our new homes. While my own travels don't generate stories worth sharing with great frequency, I am an obsessive reader, and often come across essays that readers of this blog would find interesting. I hope to post a monthly list of some of the best pieces I've encountered, including eye-opening travel narratives, commentaries on foreign affairs, insightful profiles of foreign places and people, and essays offering new ideas and ways of seeing the world. Fascinating window into the obsessive world of amateur baseball in Japan. A more informed look at the comparison that's been tossed around a bit too much this month. A powerful screed against the state of modern war reporting, from an Italian stringer risking her neck in Syria. My good friend Alex on the importance of inter-cultural exchange in tough times. Welcome to the underworld of African mining deals; a well researched and intriguing piece. On the microeconomics of the Arab Spring; not the whole picture by any means, but an under-appreciated aspect of the event's many roots. Interview with a longtime Damascus resident; useful bits of perspective from an outsider who sounds like he knows Syria well. There can't be many capital cities in the Arab world with less visible nightlife than Algiers. Their culture shaped by a decade of nighttime curfews during the 1990s civil war, Algerians just don't like to frequent restaurants, bars, cafés, or shops at night. At least, so goes the popular wisdom. 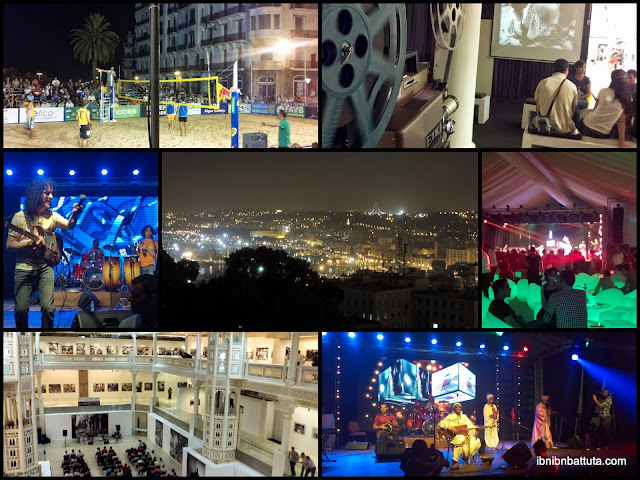 While an underground party scene does exist behind closed doors, as I am starting to learn, Algeria still faces accusations of being downright "boring" on the face of it. Luckily, with some concerted (if not a little desperate) efforts by the government, the Muslim holy month of Ramadan sees the capital's streets much more animated at night. Museums are opened, public fairs and sports competitions organized, and concerts put on, with performances by artists in the most popular local genres—rai, chaabi, and of course hip-hop. Bus, light rail, and metro services are extended well into the night. Additionally, on the eve of Ramadan the Prime Minister publicly pleaded with shop owners to stay open "past 9:00pm" (as if most stay open anywhere near that late normally). After more than a decade of poking around the globe, a few lessons have crystallized in my mind. One of the most enduring is that everyone has a story. Some people have many stories, and can tell them for hours on end. But with enough vocabulary, enough hand gestures, enough smiles—and yes, sometimes, enough alcohol—there really isn't anyone on this planet who can't be coaxed into telling a unique and fantastic and one-of-a-kind story—the kind that you can't stop thinking about long after you've heard it, and perhaps long after you and the storyteller have forever parted ways. In the wonderful world in which we live, a simple chance encounter can leave you with a story so moving, so funny, so downright bizarre that no one could ever have imagined it. Some of these stories last hours, some are only a sentence, but everyone has them. After a year of frequent trips back and forth between Washington and Algiers, earlier this month I packed my bags and made my long-anticipated transition to Algeria. I am now based here in the capital, Algiers, where in the coming months I will be working directly on a series of political development projects. Since my first visit last spring, I have spent nearly six months in total here. Even so, I cannot pretend that Algiers—much less the country as a whole—is a place I know well. Geographically, Algeria is the largest country in Africa and the tenth largest in the world, with an intricate mesh of identities and dizzyingly complex history. Suffice it to say I have much to explore and much to learn. Recognizing how little most outsiders—even fellow enthusiasts of the region and its cultures—know about Algeria, I look forward to sharing observations along the way. While words have always been my prefered way of recording my travel experiences, in recent years I have dabbled with photography as a means of capturing the ambiance of foreign places. Since the moment earlier this year when I "discovered" my dad's antique Rolleicord, I have been curious how it would fare on the road. Part of me worried that perhaps it was too bulky or too delicate for traveling. And what happens to film in airport X-ray machines? But I reminded myself that Erik Gauger, author of Notes from the Road—long one of my favorite travel blogs—uses a far larger and more cumbersome camera to take his ultra-vivid shots. Surely I could manage with the Rollei. So in February, as I was heading out the door for a work trip to Algiers—with an extended layover in Paris with the lady friend en route—I squeezed the Rollei and some film into my carry-on bag. 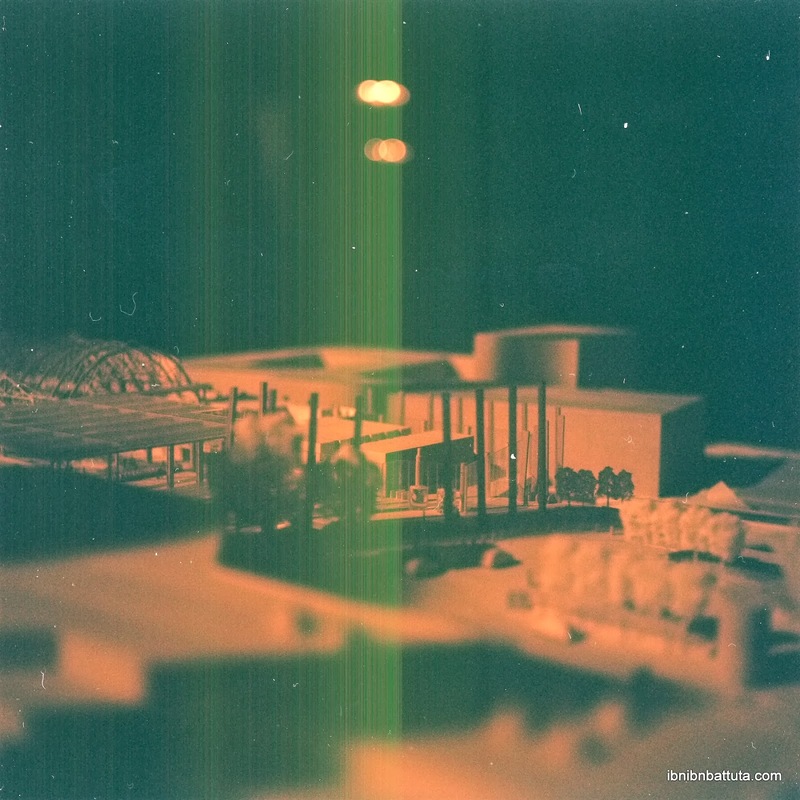 A few years ago, I was poking around my family's attic in Baltimore and came across my dad's old Rolleicord camera. Clueless as to how to produce a picture with it, I let it sit—until recently. "After jetting around the world as a foreign correspondent, after flying into stories, after driving into them, helicoptering in, even, I thought about what it would be like to walk between stories. Not just to see the stories we were missing by flying over them, but to understand the connective tissue of all the major stories of our day." Even today, long after the days of Ibn Battuta, Some people take epic super-trips. Like this guy, Paul Salopek, quoted above. Today he set out on an Ethiopia-to-Chile-by-foot odyssey that he expects will take seven years to complete! (He'll be blogging here). Or this guy, who has already been going since 1998 yet is still only halfway to his destination. Unfathomable. Sometimes I wish I would do the same. But could I finish? Or would I be just as bad at trekking onward for years on end as I am at maintaining focus on basic tasks in my daily existence as a cubicle dweller? Would the itinerant life lend me focus, fortitude, purpose? Or would it break me? Would it matter if I didn't finish? What would I give up in going? I pose these questions of myself mostly for perspective, but I would be lying if I said a part of me does not want to try it.